Get the Dillon (223 on far left). The Wilson gauges I have are for calibers that Dillon doesn't make gauges in. The Lyman case gauges have been reported to have a small dimension at the rim of the case, giving incorrect indications. The big advantage of the Dillon gauges is that they are SS (stainless steel) and will not rust, besides being accurate dimension wise. My Wilson's I have to keep oiled as they will rust because they are carbon steel. Just like the Lyman. Bottle neck case gage for rifle. The Lyman will check case diameter & head to datum & trim. Other do not check case body diameter. The Lyman gage for .223 Rem cases is cut too small at the rim recess and won't accept cases that run to the high end of the SAAMI dimension (0.378 inches). 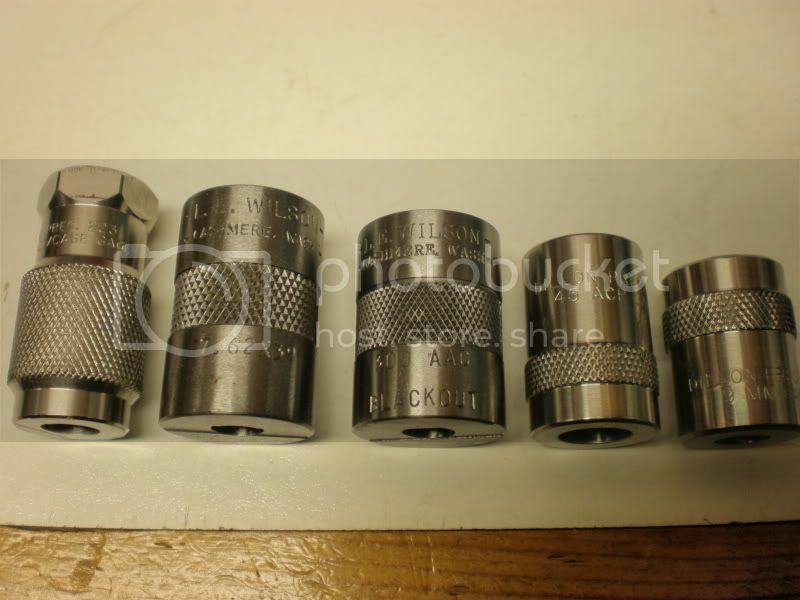 For cases that fit, this gage sets the sizer die for 0.008 inches of headspace, same as the Wilson I own.